This small paradise is only 15 minutes from the city center, this villa enjoys an exceptional natural environment with a breathtaking panoramic view of the Atlas. They have 4 bedrooms with private bathroom fully air conditioned with fireplace tv wifi. 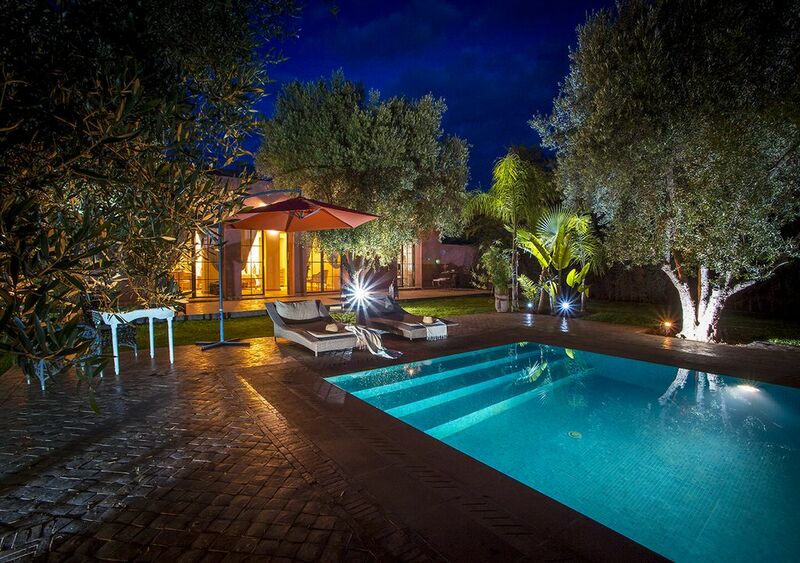 the estate can be rented in its entirety with its luxurious infinity pool and gardens. The Paschmina villa in Marrakech has housekeepers and cooks. They will welcome you all year long with family or friends. Following requests from former guests, you can now choose between a half board and a full board option. You can let the staff prepare all your meals while you relax by the pool. The 4000 m of private estate covered with olive groves and bougainvillea are closed and constantly monitored. We expect tenants respectful behavior, Moroccan guests are prohibited. Beautiful Villa Amazing Service Just what we Expected. Lovely villa spacious amazing garden and great host. Lovely furniture and space. Private and very secure. Just check location before you go as the app wasn't correct April 2017. Kitchen breakfast very nice by maids. Host may be living on site his name is Ahmed he is very very helpful and there every minute to help. Ahmed made the trip for us he was great and really helped without him the trip wouldn't be the same. He recommended alot and was there to offer anything we needed. The villa lounge is very nice. The pool is also lovely may not be heated so check beforehand. All in all an amazing place to stay you will enjoy truly the gardens rooms furniture food host and most of all peaceful sound of birds. Very clean villa cleaned daily the quality of bedding and comfort is 5 star. Suprised how low the price was for a great place. Nearby aqua Park amazing for kids and also famous beach party is great for youngsters to enjoy music etc. Really was a great stay cannot say enough about the service provided by maids security and host Ahmed. We will defo go back again soon as we couldn't get this service anywhere else. I have visited marrakesh 4 times this was my best time. Best holiday I have had in years. The house was beautiful and so was the location. The food was delicious and the owner couldn't have been more helpful. The cook was wonderful and charming. Ahmed et Sophia sont exceptionnel !! L'annonce et les photos correspondent à la maison et plus encore. La maison est décorée à l'européenne avec beaucoup de goût. La piscine est grande et permet de se baigner en famille sans problème . Le terrain de 4000m2 est arboré d'oliviers, grenadiers, citronniers... Mention spéciale à la cuisinière Zineb qui durant notre séjour en famille nous a préparé de superbes repas qui sont tous très copieux et variés, le petit déjeuner était exquis au bord de la piscine. Nous avons aussi profité des services de Nora la nounou à domicile qui s'est occupée de notre bébé de un an durant le séjour, ce qui nous a permis de profiter plus sereinement de la piscine et de nos repas. Le logement est très propre avec un ménage quotidien. La piscine est elle aussi très propre avec le gardien qui la nettoie tous les soirs. Ahmed nous a donné les bons plans pour trouver un taxi, les lieux à visiter et les bons magasins pour le shopping de Madame à de supers prix. Nous vous le recommandons vivement et nous y retournerons certainement.